Only 10.5 gm. (~ 1/3rd oz.) is the weight of ENTIRE Petite Aviator - Only bird harness designed for flying birds - Easiest to install - 1 piece design - No buckles or clips. Only 1 slide to adjust harness. No Stitching for your bird to play with. Escape-Proof! Many other brands have leads and leashes with buckles and clips that can be easily removed by your bird. The strong steel slide has been powder-coated black to make them unattractive as toys. Self-adjusting Elastic Leash: Automatically adjusts from the chest to the back as the bird climbs and flies and eliminates a SUDDEN IMPACT when he fly's to the end. Efficient design has fewer pressure contact points on your bird. Includes 45 minute training DVD in 6 languages. Great product. Takes some time to get use to. The product seems nice and the delivery was quick. 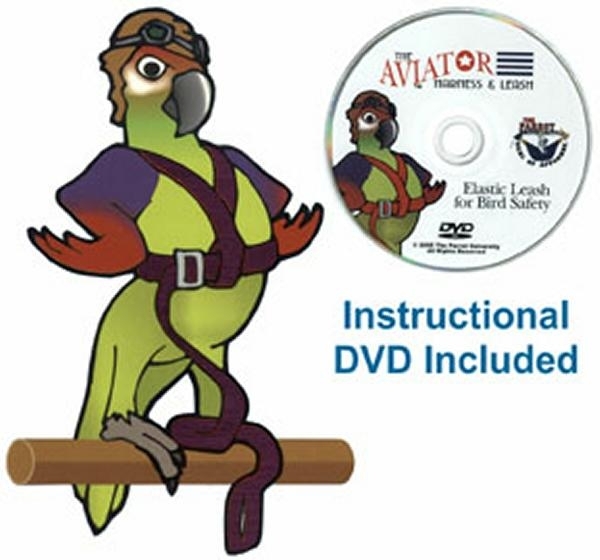 The DVD with the bird leash was not very helpful though. High-quality product, well designed, and the DVD is very helpful!